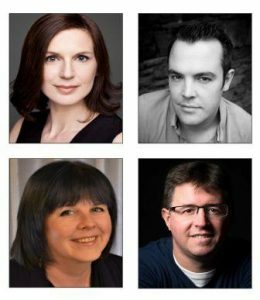 Miles Horner, Donna Lennard, Sue Pettitt and Ralph Woodward are the quartet bringing Cracked Voices to life. Miles Horner was born in Lichfield and studied at Leeds College of Music, working with international Soprano Lynne Dawson. His performance in Don Giovanni, (Focus Opera), at Buxton Opera Festival was described by Sir Peter Maxwell Davis as “One of my favourite Don Giovanni’s.” Other engagements have included Fauré Requiem with the Royal Northern Sinfonia and Messiah with the Philharmonia Chorus in Valencia, Spain. Amonst his more recent roles are Morales, Carmen, (Opera Brava), Basillio, Il Barbiere di Siviglia and Benoit/Alcindoro, La Boheme (OperaUpClose), Aeneas, Dido and Aeneas (Opera Lyrica) and he created the role of Hughie Mann in the world premiere of Marcos Fernandez’s opera, Miracle! An Opera of Two Halves. In between the two Cracked Voices concerts, he will be resuming the title role of Don Giovanni in Kuwait City.